Trying to find your kids or family members and talking to them about their day. Find a quiet place, grab a newspaper or tablet and spend a few minutes on it. Which activity did you choose? If you are a woman, there is a high possibility of you having chosen ‘a’. And if you are a man, you may have most likely chosen ‘b’. 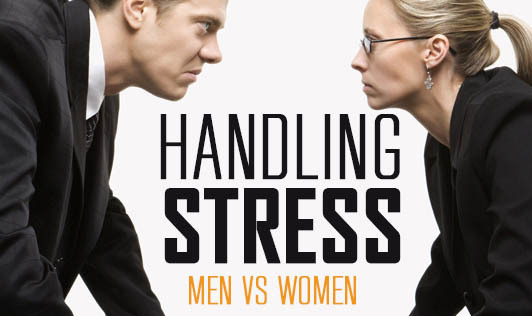 Why is it that men and women have such contrasting ways of dealing with stress? Men exhibit a more primal ‘fight-or-flight’ response which is a way of defending oneself. This type of response is characterized by a sudden rush of blood to the muscles, elevated heart rate, and higher blood pressure. Individuals experiencing the fight-or-flight response generally like to be left alone until they sort things out and settle down into relaxation. In fact, they may get aggressive if forced to interact with others during such times. Women, on the contrary, exhibit the ‘tend-or-befriend’ response characterized by minimum aggression and more affection. Women tend to reach out to their close ones during stressful times and are seemingly less irritable. The science behind there being such a vast difference in reaction between the two sexes is due to varying levels of hormones, oxytocin and testosterone. Women produce higher levels of oxytocin, a hormone necessary for nursing, which also decreases anxiety to a great extent. Men produce higher levels of testosterone, a hormone known to increase aggression. Therefore, it is important to understand that the response is entirely hormone based and neither method for handling stress is better. However, one interesting fact is that the ‘tend-and-befriend’ response helps an individual connect with loved ones which indirectly is a good way to help manage and reduce stress.